The following table shows the release date of past and future versions of OpenNebula. (*) OpenNebula is truly open-source software, all source code is publicly available in our repository. The OpenNebula project publishes this Release Cycle Policy in an effort to provide as much transparency as possible and may make exceptions as necessary. OpenNebula follows a rapid release cycle to improve user satisfaction by rapidly delivering features and innovations based on user requirements and feedback. In other words, giving customers what they want more quickly, in smaller increments, while additionally increasing technical quality. Each upgrade or major release of ONE is denoted by a single major number, i.e. : ONE 2. A new major release typically means significant changes that may involve changes in the interfaces, core and data base and so may require a complex upgrade process for production environments. Each update or minor release of ONE is denoted by a major and a minor number, i.e. : ONE 2.2. A new minor release typically signifies enhancements, optimizations and bug fixes that may involve small changes in the core and data base and so allow a seamless upgrade process for production environments following a pre-defined migration path. Each incremental release of ONE is denoted by a major, a minor and an incremental number, i.e. : ONE 2.2.1. A new incremental release typically only includes bug fixes and minor enhancements. 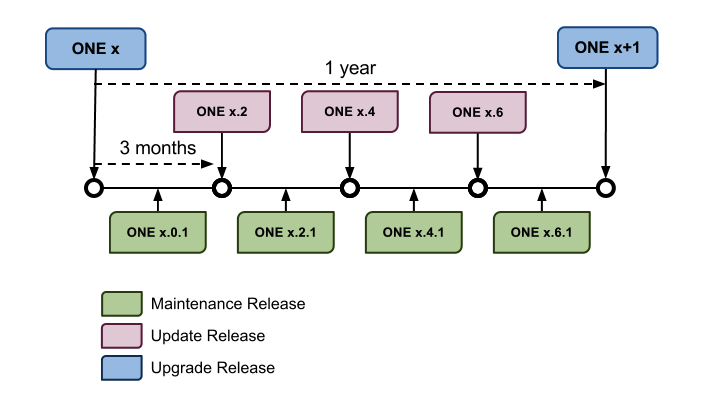 Incremental releases can be maintenance public or hotfix private releases. Hotfix private – Incremental update to fix specific issues. Although all code in OpenNebula is fully open, packages from hotfix incremental versions are not publicly released, and are only available for users with an active commercial subscription. Maintenance public – Incremental update between minor/major releases to fix multiple outstanding issues. Both code and packages are publicly available. A new upgrade (major release) of OpenNebula approximately every year and to provide two or three updates (minor release) for each major version. This means that there is an OpenNebula release every three or four months. Additionally there are four maintenance incremental releases every year, one between two consecutive major or minor releases. The Project will asynchronously distribute hotfix incremental releases for critical impact issues. After its first year, and for two additional years, the Project distributes a service pack (SP) for each major release that combines all the patches to easily install or deploy its last update. Prior to an official major or minor release date there is a beta release two weeks before. This beta release marks the feature-freeze for the release and development efforts are then mainly devoted to bug fixing and polishing. The software is thoroughly tested through a internal quality assurance process before its release. The OpenNebula project prepares packages of all releases for the most common linux distributions. 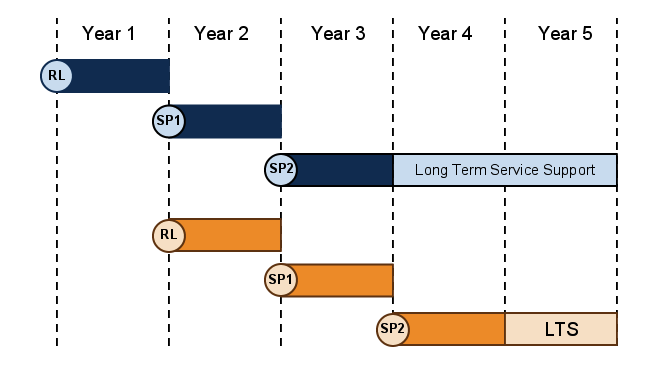 During the entire life cycle, the Project makes reasonable efforts to maintain compatibility for the core and data base across all minor and maintenance releases. The Project may elect to make exceptions to the compatibility goal for critical impact or other significant issues. The OpenNebula project can only provide community support and maintenance for the last minor (update) version. If you want a longer time support, OpenNebula Systems provides support and maintenance during 5 year periods for each of the major releases of OpenNebula.